Rudyard Kipling’s Mowgli is an enduring character who is said to have inspired American fiction writer Edgar Rice Burroughs… and perhaps restaurateur Nisha Katona too. The photogenic barrister turned entrepreneur is the founder of Mowgli Street Food, a line of eateries which promises to dish up food that Indians eat at home and on their streets. Mowgli Street Food was born in 2018. First came Liverpool Mowgli and six more high profile openings soon followed. Fresh from being awarded an MBE, Nisha is eyeing up more locations to bring Mowgli Street Food to the masses. I have dined at the Manchester Trafford Centre Mowgli and liked it; would Nottingham Mowgli be just as good? As an author and self-confessed bibliophile with a passion for reading, I am also partial to a little Rudyard Kipling, which is how I found myself at Nottingham Mowgli one Thursday evening. 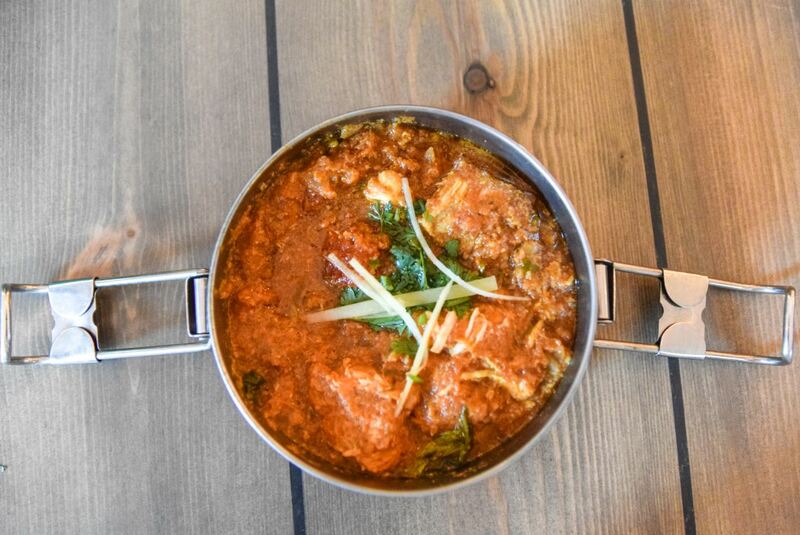 Nestled on the corner of Stoney Street Nottingham, Mowgli Street Food beckons you to enter its cosy confines. There is a palpable buzz in the air, a certain je ne sais quois which heightens your senses, preparing them for something that promises to be distinctly unique. I walk briskly into Mowgli Nottingham, desperate to get out of the icy cold air, and I’m immediately enveloped by warmth. Everything seems delectably warm. The ambient temperature inside, the warming smiles of the front of house, even the lights emit a warming yellow glow, automatically making the restaurant a lovely place to be. I am also hungry. It is a busy for a Thursday evening, and we manage to get a table for two within a matter of minutes. There are a selection of menus (Celebration, Sharing, Vegan, and Kids’), and because we are on the verge of getting hunger pangs, we order off the straightforward main food menu. I love everything about chaat, which has been one of my favourite dishes since childhood. 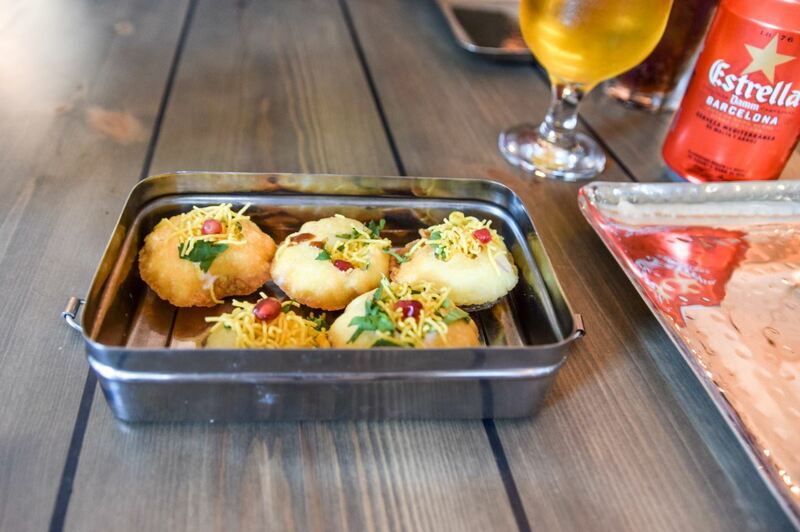 There is something so very intoxicating about fried puffs chock-full with a spicy mixture, and the Mowgli yoghurt chat bombs do not disappoint. Fragrant chickpeas, spiked yoghurt and earthy coriander make for a heady combination; I could happily eat a plate full of these crispy beauties and not care about my gluttonous vibes. My main of Agra ginger chicken is nice and warming on the throat, whilst succulent tomato tempers the potent garam masala. I like the addition of creamy spinach, that is at the just-cooked-therefore-silk stage. Dining partner’s Mowgli house keema is very good. Heavy on the cinnamon and freshly roasted cumin, this dish is hearty, delicious, moreish and a hug in a bowl. 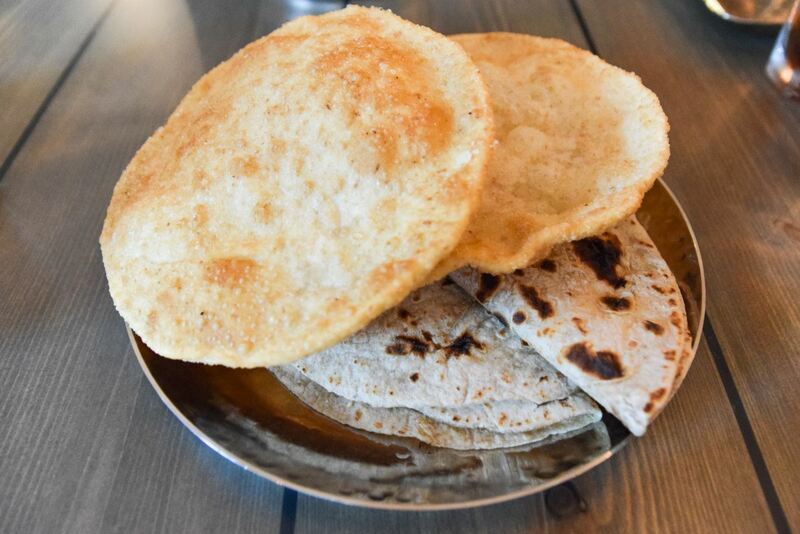 Scooped up with fresh puris is the best way to eat this dish. As the sauce runs playfully from the light fried bread, you are obliged, nay entitled to lick your fingers and smack your lips in a most satisfying fashion. Referring to my review notes, I compare the two Mowgli’s, and find that I prefer dining at Nottingham Mowgli. That is not to discount Manchester Mowgli, because that is a lovely place in its own right. The food at Nottingham Mowgli appears to be just a little more grown up than its Mancunian cousin, but I would expect dishes to evolve over time, and this can only be a good thing. The Nottingham venue too, seems cosier, friendlier, and yields a more satisfying dining experience. I will most certainly return to Nottingham Mowgli (and order two portions of those moreish as heck chat bombs). How to make reservation: No bookings. Walk-in only. Whilst in the area: Visit Five Leaves Bookshop, an independent bookstore stocking independent publishers. They have a busy diary of events, and regularly host readings and author talks. Well, now I’m starving. All the food seriously looks so amazing. I could eat there all day! Hello Stacie, thank you for stopping by. Yes the food was delicious, and as a fan of chaat (and fried bread), I was in heaven. thank you for sharing your thoughts about the experience. It’s always nice to read the reviews, they help in the choice. Wow! Mowgli Street Food Nottingham sounds so interesting and the foods look so delicious. Wish I could be here right now. Great review! I’ll have to try some of these dishes at a restaurant that is local! Yum! I love this. You have suggested some dishes that are making my mouth water right now. 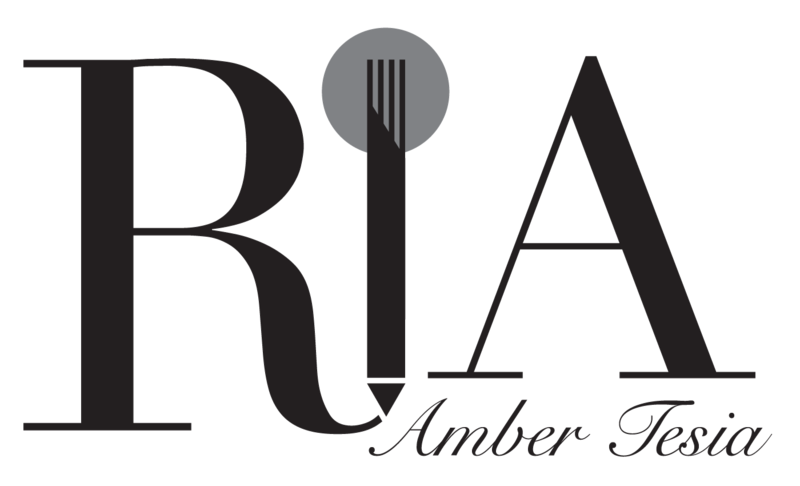 I will have to keep this restaurant on my list for the next time I am traveling there! I heard a lot of good reviews about Nottingham Mowgli. I bet you had an awesome time at Nottingham Mowgli! Awesome review. I would love to try out some of their dishes too. I haven’t had chaat before, but it looks wonderful and nice and fresh, too. Everything sounds delicious! It’s nice to find such a good restaurant! Your photos make me so hungry! THis looks like such an amazing restaurant. This looks really food I would love to eat here. The food is amazing. This looks like a fun place to eat. I would love t try their food when I get a chance to go to the area. I was curious about their food when I first hear it. Then I got a chance to eat there. Agra ginger chicken is really good and I love everything in that restaurant. The food looks and sounds delicious! I’d love to try that place!